The wendigo (also known as windigo, weendigo, windago, waindigo, windiga, witiko, wihtikow, and numerous other names) is a demonic spirit believed by Algonquin-based Native American tribes to possess humans and turn them into cannibals. The term "Wendigo” is used to describe an evil spirit as well as a creature that humans can become when possessed by the spirit (Kingaton). Many legends and stories have circulated over the years about a mysterious creature that was encountered by hunters and campers in the forests. According to lore, the Wendigo is created whenever a human resorts to cannibalism. During some harsh winter a guy finds himself starving, cut off from supplies or help he becomes a cannibal to survive, eating other members of his tribe or camp(Haden). Cultures all over the world believe that eating human flesh gives a person certain abilities such as speed, strength, and immortality. If you eat enough of it, over years, you become this less than human thing. Wendigos are said to be very hard to kill. The Wendigo have few weakness, as far as weapons are concerned it can only be killed by iron, steel and silver. The most gruesome method of disposal is by shattering the creature’s ice heart with a silver stake and then dismembering the body with a silver axe(Kingston). Colombo, John. Windigo: An Anthology of Fact and Fantastic Fiction. Canda. Modern Press. 1936. Print. Taylor. 2002. 17 October 2012. Kingston, W.H.G. “Adventures among the Indians.” Pararesearshers.org. John W. Lovell company.1888.Web. 12 October 2012. Medals, Henry. Wendigo. Photograph. 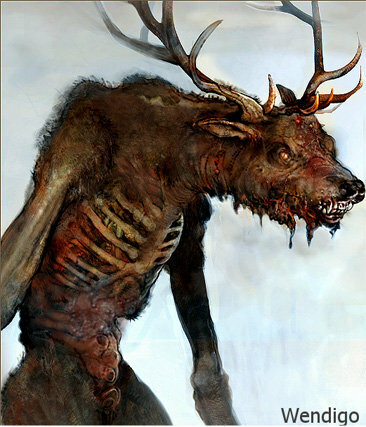 http://monster.wikia.com/wiki/Wendigo, 22 February 2010. Web. 17 October 2012. This article gives information about the Wendigo and also talks about people giving speeches about the creature. This website compares the Wendigo to other creatures like Bigfoot.